Review of Dogfish Head Namaste | Beer Apprentice - Craft Beer News, Reviews, Interviews and Info. For today’s craft beer review I’m going to be trying the Namaste brewed by the Dogfish Head Craft Brewery located in Milton, Delaware. This is another brew that I’ve had many times, but for some reason I’ve just never given it a proper review. Let’s get to the website, dogfish.com, and see what kind of information we can drum up about the Namaste. Namaste was originally brewed at our pub in Rehoboth Beach with our Italian friend Leo from Birra del Borgo. It was a tribute to our friends at 3 Fonteinen brewery in Belgium, who had devastating production loss (1/3 of their annual production) in 2009. You can read more about the original brewing of this beer here on Sam’s blog. This brew has an ABV of 5.0% and it comes in a 25.4 oz. bottle. The Namaste poured a cloudy yellow to orange color with some bright yellow highlights around the bottom and edges of the glass. A huge, bright white head was formed from a fairly easy pour. It was soapy, frothy and rocky. The retention time was excellent and the lacing was patchy and “cobweb” like, however it didn’t cling to the glass all that well. The nose released hints of lemon citrus and lemongrass. Tons of coriander. I did pick up on the orange sweetness, but it was, honestly, very light. As the brew warmed a touch I began to discover some clean white bread and grain tones. Overall, not too bad on the nose. Nothing real robust or complicated, but rather quite lively and bright. The taste was very clean and fresh. Lemon citrus, lemongrass, wheat, breads and grain. Like the aroma, any sort of orange citrus was very subtle and delicate. The coriander tickled the tongue and a light touch of hops and bitterness finished off the flavor. The mouthfeel was medium/thin. Smooth, crisp, clean, snappy, thirst quenching and refreshing. It was quite watery also. A lively, spritzy carbonation bit the tongue from the get go and some, but not a lot of flavor was left behind after each drink. Overall, I think this is a pretty good beer. It would make for a killer Summer session brew that’s for sure. It was so easy to drink. Literally, one could take huge gulps of this and not think twice about it. It doesn’t really present anything that’s overly complicated or out of the ordinary, however it does have plenty of character to satisfy anyone who appreciates the Witbier style. It represents it very well. It’s definitely worth a try if you have yet to do so. 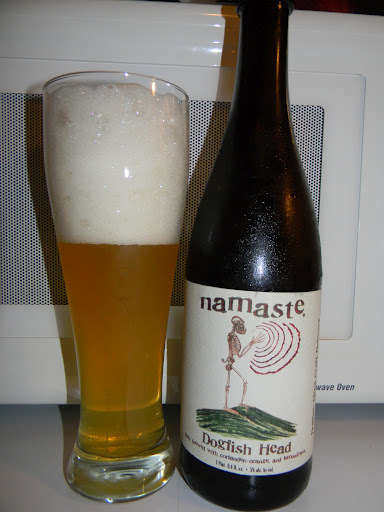 With that being said, pick up a bottle of the Dogfish Head Namaste this Summer and see what you think.